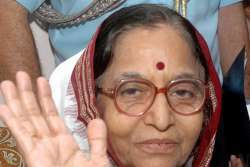 Pratibha Patil (Jalgaon, Maharashtra, India 19 December 1934) was the 12th president of India (2007-2012), the first woman to hold that office. Patil is a post-graduate in arts and law. Besides having been president of the Maharashtra Congress chapter, she is credited with establishing hostels for "working women" in Mumbai and New Delhi, an engineering college at Jalgaon for rural youth, a women's cooperative bank also at Jalgaon, and schools for poor children in Maharashtra. She is married to Devisingh Shekhawat, also a Congress Party politician (Married on 7 July 1965). The couple have a son and a daughter. She upset Islamic leaders by asking Indian women to abandon their head scarves.